Employers, EV advocates, and participants: Below are materials you can use to spread the word about the Nissan LEAF Group Purchase program. Employers, we recommend reaching directly out to your employees to ensure everyone is able to hear about the opportunity. Because our company is a partner in the Drive Electric Northern Colorado Workplace Charging Challenge, our employees have access to a group-purchase program for the Nissan LEAF. 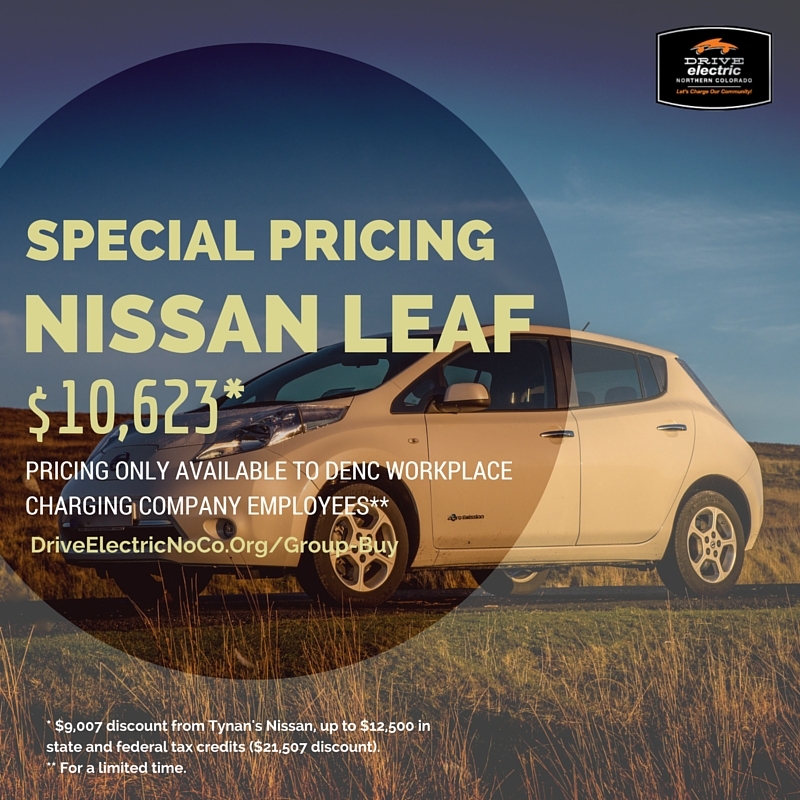 With tax credits and group-buy discounts, DENC workplace charging partner employees can purchase the LEAF for $10,623 (a savings of $21,507). The 2015 Group-Buy is a pre-negotiated price for the Nissan LEAF. The opportunity is currently only available until December 31, 2015. To learn more and schedule a consultation, visit the website (Click here). Email Body: Because of our company’s participation in Drive Electric Northern Colorado’s Workplace Charging Challenge this year, our employees have access to a special group-purchase opportunity for the Nissan LEAF electric vehicle. This opportunity has been opened to our company and 17 other Northern Colorado employers that are a part of DENC’s Workplace Charging Challenge, reaching over 15,000 employees in our region. The 2015 Group-Buy is a pre-negotiated price for the Nissan LEAF, which for a limited time is only open to workplace charging partner employees. The opportunity is currently only available until December 31, 2015. Visit the website (Click here), or see the chart below for pricing and more information. INSERT CHART IN BODY OF EMAIL. EVs provide the opportunity to decrease vehicle emissions and oil use, and now workplace charging partners have access to the nation’s best-selling all electric vehicle at a pre-negotiated, discounted price. Visit the website (Click here) for more information and to schedule your consultation. As a @Drive Electric Northern Colorado Workplace Charging Challenge partner, our employees have access to a group-purchase program for the Nissan LEAF, which offers significant discounts at a pre-negotiated price. With a potential savings of $22,507 off the retail price, our employees can purchase the LEAF for $10,623. EVs provide the opportunity to decrease vehicle emissions and oil use, and cut the cost of your commute with ongoing savings from decreased maintenance and fueling for EVs. To learn more and to sign up for a consultation, visit http://driveelectricnoco.org/group-buy/. INSERT SAVINGS CHART ABOVE.